I just got back from the VLAB Multi-platform Social Networking event, which I thought was very interesting overall. Jeremiah Owyang did a great moderating job, and Jia Shen, Sourabh Niyogi, Ken Gullicksen and Steve Cohen brought lots of different viewpoints to the discussion. Growing and deriving value from Apps within Social Networks is still full of lots of unknowns, but it was good to hear some basic shared principles come through - my summary of one point was 'before you think about a Business Model, make sure you have a Pleasure Model'. Another point well made by Steve Cohen of Bebo was something I've been thinking for a while too - the hunger for 'Viral' growth is a mistake - what you really need is 'Organic' growth. Just as we distinguish between Organic search results and bought or spammed ones, social network sites and their users are distinguishing between the viral apps that are essentially parasitic, using their hosts as a means to their propagation, and the ones that organically become part of the social ecology, making both the site and the users richer by their presence. I spent the last weekend fighting off a flu virus, partly by eating lots of organic fruit. I expect social networks and their users will continue to do the same. I'm in Geneva for the LIFT conference, watching Bruce Sterling riff on Carla Sarkozy as a black swan. 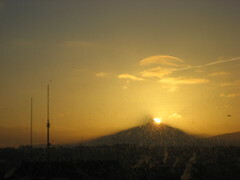 The photo is what the sunrise looked like over the Alps at breakfast.